We specialise in flyfishing supplies, but also stock a wide range of game fishing and coarse fishing tackle too. 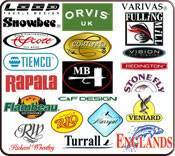 We stock over 100 brands from leading fishing tackle manufacturers worldwide, and you can search for these either by Fishing Tackle Category or by Tackle Manufacturer Brand Name. 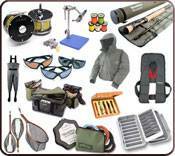 Our secure UK online fishing tackle shop has all forms of fishing equipment and accessories for freshwater fishing and sea fishing, and includes fly rods, fly fishing reels, lines, clothing, waders, waterproof jackets, bags, fishing glasses, luggage, boxes, flies, fly tying equipment and materials, float tubes, boat accessories, outboard motors, hooks, fish finders and dvds for all methods of fishing including flyfishing, spinning, baitcasting, boat fishing, match and carp fishing.